Welcome Parents, Students, and Staff to our Organizational Meeting. • As a “Pep Band” at home football games + Thanksgiving away and home. • As a “Parade Band” at four hometown parades. • As an “Outdoor Performance Ensemble” for evaluation and competition. We learn one show for the entire season, unlike many college bands that learn multiple shows per fall season. The Woodwinds and Brass are all marching members and play melodic, and or counter melodic parts. 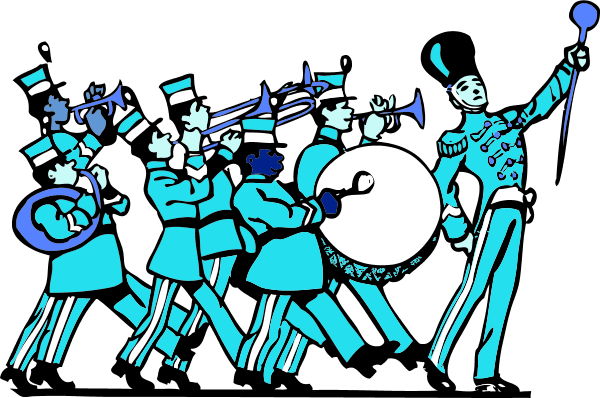 The Battery – (Marching Percussion) carry their instrument and march. The Color Guard is the section that visually represents the music and emotions created by the music. Sometimes it is with a flag, a sabre, or a rifle. Sometimes it is based on dance depending upon the mood and or style of the program. • Awareness of the individual’s role in a large group activity. • Student awareness on how to manage their time. • To be on time, is to be early. Students should plan on being at events and rehearsals 15 minutes prior to the scheduled time. This allows them to stretch out, take cafe of any equipment needs, and be prepared to start rehearsal on time in order to maximize our potential as a performance group. 1. A professional sporting event. 3. A family birthday celebration. *Students that choose to participate in a fall sport will be given leeway in order to get to rehearsal after a game or team practice as long as every effort to get there quickly is made. May 31st (T), June 2nd (R) 6-8 P.M.
June 7th (T) 9* (R) 6-8:30 P.M.
July 12th, 19th, 26th (T) 5:30-8:30 P.M.
August 23rd (T), 24th, (W), 25th (R) 5:30-9 P.M.
August 30th (T), August 31st (W), September 1st (R) 5:30 – 9:00 P.M.
Saturdays 10,17, 24-9 AM to 3 PM/AsScheduled. Saturdays 1, 8, 15, 22, 29 As scheduled due to performances. Saturday, September 10th Norwood Day Parade, Football vs Framingham 1 PM Sunday, September 24th, NESBA Competition at Melrose H.S. Sunday, November 27th, Holiday Parade in the Afternoon. Monday, May 29th, Memorial Day Parade 10 A.M.
A detailed schedule will be made available before the new school year. Weekly updates will happen via email and Facebook. Rehearsals will take place on the turf field-at NHS. IF the turf field is unavailable, we may move to the Cleveland Elementary School or other useable venue. For many decades, the Norwood Music Program has travelled to Sweden Maine for the annual music camp at Camp Tapawingo where we are the only school on site. At this camp we hope to gain a leg up on our competition by maximizing our time to learn while still having opportunities for the students to play organized sporting games, swimming, social time, eating and sleeping. Camp Tapawingo is a rustic camp in Maine near Shawnee Peak and Bridgeton, ME. Students will have daily schedule beginning with Revile, Breakfast, Morning Rehearsal, Rest Period, Lunch, Activity (swimming or sports), Dinner, Evening Rehearsal, and Social time. (Lets just say the students’ sleep well after a long day!) How do we insure this? We are fortunate to have a staff of alumni that serve as councilors for our week away. They help us take great care of the students in the Marching Band, Color Guard, Madrigal Choir and the Second Choir and or Theater students from Norwood. As many of the returning students know, camp is a special opportunity, and it is hard work but includes some very fun memories that last a lifetime. Marching Mid Brass and Low brass instruments are supplied by the school: Tuba, Mellophone, and Baritone. All percussion instruments are provided. Colorguard equipment is provided but members will need to purchase an equipment bag. A Norwood High School band uniform will be issued to each member of the band. You will be responsible for any needed alterations, typically a hem of the pants or cuff. Students will be asked to Dry Clean it at Lustra Cleansers and return it before December Vacation. If the band is caught in bad weather/mud, students may be asked to clean their uniform an extra time. Band members will need to purchase gloves and shoes. This will be coordinated by a parent volunteer. The Color Guard will be issued an “Outfit” that will match with the theme of our show. Students will need to purchase a bodysuit to wear underneath this outfit as directed. • Spending money at evaluations and competitions, as needed. Students will have fundraising opportunities as an individual and may be asked to help with fimdraising activities for the Marching Band and Color Guard during the season. Parent/Guardian Help Is Needed, and fun is to be had…. Please consider taking an active role in your child’s extra curricular activity! This group needs help in so many ways just to get the kids to their first performance: Chaperoning, Uniform Help, Pit Crew Volunteers, Truck Loaders, Prop Design, Fundraising etc….You can also volunteer by attending a monthly PMA meeting every 2nd Wednesday of the month. Everyone is a member and your voice counts at these meetings. We also host a marching band show and need lots of help to make it a great success. • A decision to participate should be reached prior to the first rehearsal. Mr. Conant immediately so we can help you become a highly successful and dedicated ensemble member. More staff will be announced as the season gets closer. Program Fall 2016 Announcement made verbally at the end of the meeting.